One of the best preserved and also one of my favourite castles is the tower house built at Aughnanure by the O'Flaherty's about 1500. I had often raved to Deb about this national monument so I was thrilled to finally bring her here. 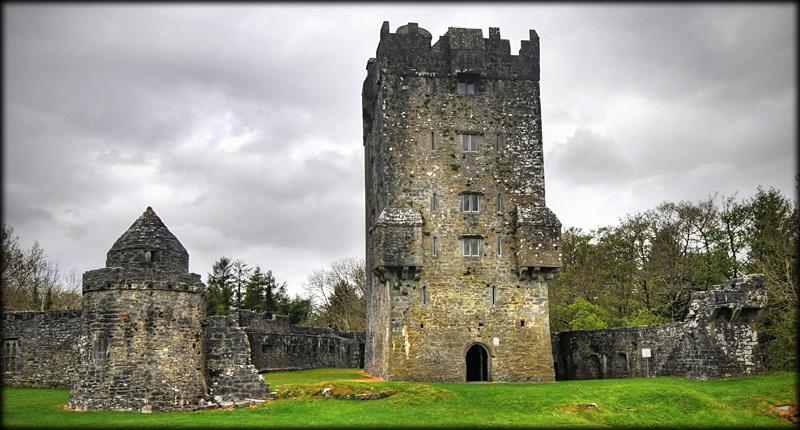 In Irish the castle is known as Caisleán Achadh na nlubhar, which translates to "Castle in the field of the yews". 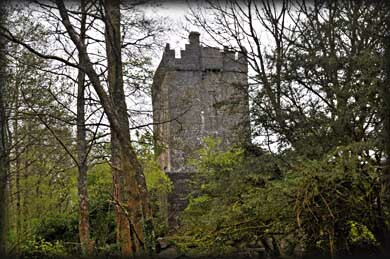 It is a heavily fortified six storey tower house, with a garret, standing on a rocky outcrop on the south bank of the Drimneen River close to the shore of Lough Corrib. The castle is unusual in that it has two bawns. 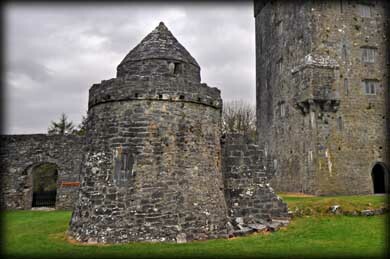 The outer bawn lying to the south and east of the tower was defended by five turrets and bastions. In the southwest corner are the remains of a rectangular 16th century banqueting hall, much of which has collapsed into the dry river which originally flowed below the hall. There are two windows remaining in the hall, the soffit of one window is beautifully decorated with carved grapevines. 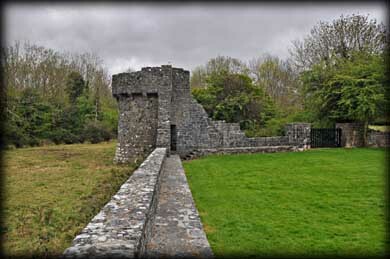 There are the remains of a gatehouse and drawbridge at the northwestern quarter (See image above). Very little remains of the walls from the earlier wedge-shaped inner bawn apart from a small round turret standing at the southeast corner ( see image below right). It seems totally out of place until you realise there were two bawns. 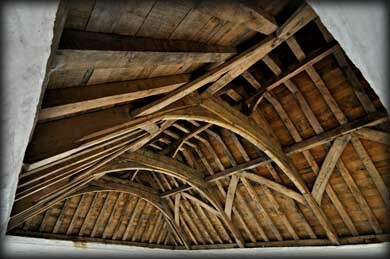 It has a fine corbelled roof and was later reused as a dovecote. 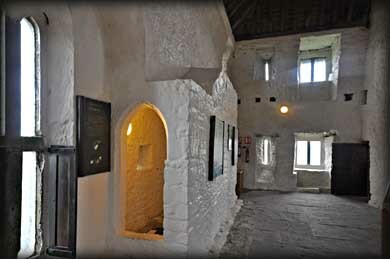 At the top of the tower is a gallery that provided a complete view of the courtyard. The tower was built in two phases and is accessed through a door in the east wall on the opposite side to the gatehouse. As you enter the lobby you will see a murder hole in the ceiling above and a spiral staircase to your left. Each floor has a main room with a smaller one to the east. The bottom floor was used for storage. 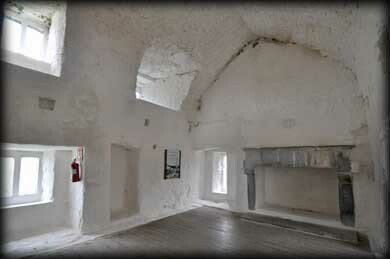 As expected the banqueting hall in the tower has a large fireplace. 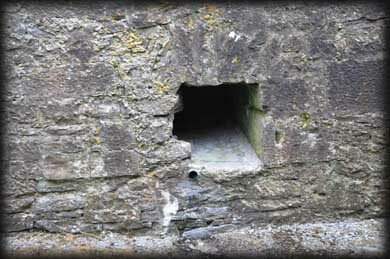 There is another fireplace in the south wall of main living quarters. Also on this floor is a latrine with a trapdoor leading to a secret chamber. 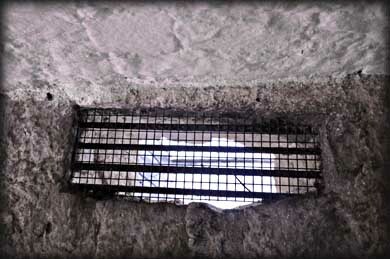 This chamber was in the haunch of the vault below and used to keep prisoners. There is also a garderobe on the 1st floor. At parapet level on each wall of the tower is a central machicolation. The gabled garret and battlements are reconstructions. There is no public access to the wall walk and battlements. 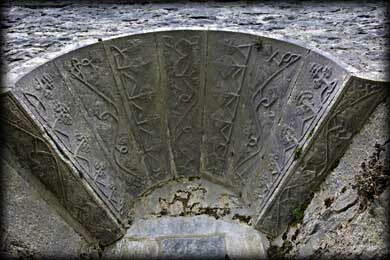 Situated: From Galway head NW on the N59 for about 21.5 kilometres. Turn right for Aughnanure Castle (Sign-posted). Follow the signs for 2 kilometres.